People often find it hard to imagine what life is like in other countries. To some extent we all live separately from the outside world. But there are some things which unite all of humanity. We all experience the same wide range of emotions — joy, despair, hatred, love, sadness, excitement, inspiration, desire. We’re all motivated to cut our own path through life and struggle against obstacles to get what we want. This collection of photographs, we think, reflects something of this gamut of feelings and emotions our world experiences every day. Once you’ve seen them, they’re hard to forget. China. An eleven-year-old boy suffering from a brain tumour requests that his liver and kidneys be donated to others, to save several other people should he die. The doctors express thanks to him and his mother. Seventeen-year-old Jan Rose Kasmir gives a flower to a soldier during an anti-war protest near the Pentagon, 1967. A ten-year-old girl smiles after being granted a divorce from her older husband. A monk shares his meal with a tiger. A three-week-old albino baby sleeps curled up next to his cousin. Bali. A man plays a bamboo flute to entertain a disabled boy, whom he loves likes his own son. A surgeon sits following a successful 23-hour heart transplant operation. His assistant sleeps in the corner. 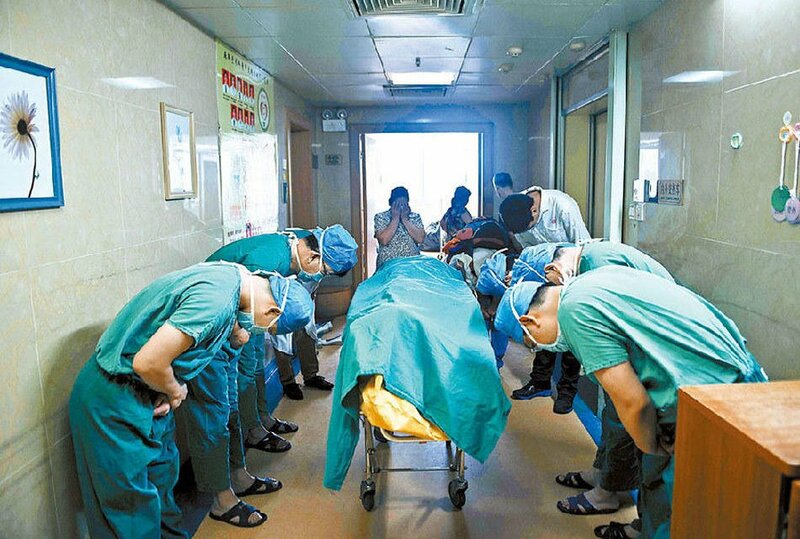 His patient not only survived, but outlived the surgeon, who died in 2009. A woman sits by the grave of her husband one day before their wedding anniversary. A woman finally receives her husband’s remains 60 years after he disappeared during the Korean War. A young man from Rwanda shows the scars he received in a death camp. China. These people prevented a woman from committing suicide. Ethiopia. A child of the Erbore tribe. Pupils at a classical ballet school in Rwanda — the first one to appear after the genocide. 100,000 monks pray for world peace. An Irish teenager screams at British soldiers during the period of disorder in Northern Ireland. Kosovo. A boy is passed through the barbed wire fence of a refugee camp to his grandparents. Afghanistan. A little girl holds the hand of an American soldier. Astronaut Anna Lee Fisher on the cover of Life magazine in 1985. She became the first mother in space. A woman from the Mursi tribe of Ethiopia examines «Vogue» for the first time.